A record number of Iowans were working last month, according to a new report from Iowa Workforce Development. IWD spokesman Ed Wallace says the state’s jobless rate in April dropped to 3.8-percent, down from 4-percent in March. “This is the lowest Iowa unemployment rate in 7 years,” Wallace said. The total number of working Iowans increased to 1,647,700 in April. That’s 600 higher than March and 23,700 higher than one year ago. “We’ve got more Iowans working today than we have ever,” Wallace said. The dip in Iowa’s unemployment rate in April occurred despite the loss of 1,700 jobs in nonfarm employment. “We had a number of nonfarm job losses, but they were offset by a number of job gains throughout all industry sectors,” Wallace said. Prior to April, the last drop in nonfarm employment in Iowa occurred in September of 2014. The loss in nonfarm jobs last month was heavily influenced by losses in manufacturing and trade and transportation, according to Wallace. The manufacturing sector trimmed 3,200 jobs in April while trade and transportation shed 1,000 jobs. “We see durable goods manufacturing leveling out a little bit, however, construction jobs have continued to advance well into the summer season,” Wallace said. The construction sector added 2,400 jobs in April due to strong hiring for highway and infrastructure projects. 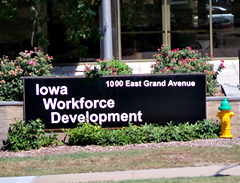 The IWD report shows 65,500 Iowans were unemployed in April. That’s down from 74,100 one year ago. While Iowa’s unemployment rate stood at 3.8-percent in April, the national jobless rate dropped to 5.4-percent.